Projects Abroad Philippines was invited to the 38th National Disability Prevention and Rehabilitation Week where the Philippines’ first Physiotherapy intern, Victor Lee, presented our efforts in establishing a community-based Rehab and Disability Centre, the first of its kind in the northern part of Cebu Island. The prestigious event, which ran from July 17th to the 23rd, was held at the College of Allied Rehabilitation Sciences within the University of the East Ramon Magsaysay Memorial Medical Centre in Manila, Philippines. Many university students, faculty, staff, and interns were in attendance. Victor, who is from Australia and currently completing his Masters in Physiotherapy, played an integral part in establishing the program. Not only was he the first intern on the project but he also worked with new patients suffering from various impairments, completed weekly house visits in the rural areas of San Remigio, established a database of patients, attended daily meetings with builders and carpenters involved in the construction of the rehabilitation centre, and met with local government bodies to discuss the development of the project. “Everyday was a surprise for me, but Projects Abroad was very much on top of everything and helped tackle each obstacle one by one”, said Victor. This was the third presentation for Victor during his four weeks as a Projects Abroad Physiotherapy intern in the Philippines. The first was at the Physical Therapy College in Bogo and the second presentation was for the Mayor of San Remigio, where the project is based. Victor said he wasn’t nervous at all during these presentations, "Maybe because I have a background in comedy, standing under a spotlight and making people laugh," he said. "I was very excited and honoured to do those presentations. Hopefully, I can inspire more locals and other people around the world to get on board with this project." Having put so much of his time and effort into the project, a major concern for both Victor and Kenneth, was the sustainability of the project. They wanted to ensure the rehab centre remained open and that new, trained interns and staff would keep administering treatment to the children and cater to the needs of the patients. Thankfully after his first presentation at the college in Bogo, the students were inspired and eager to be a part of this initiative. An agreement was made with the dean and six interns in their 5th year of physiotherapy education were assigned to the program. In order to spend more time with the interns, Victor extended the duration of his project by two weeks and was able to guide them, making sure they understood the purpose of the project, briefing them on each of the patients, and handing over the data he had collected. "Having local physiotherapy students on the team was a fantastic opportunity to truly experience the local culture and to share our assessment and treatment techniques. Ultimately, it enhanced my clinical reasoning and treatment techniques as a physiotherapist. 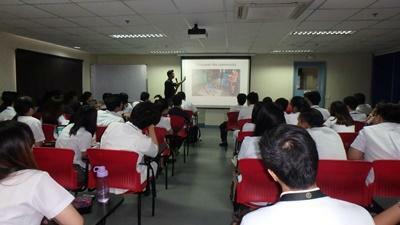 It also gave me a chance to learn about and understand the legislation of their public health system”, said Victor. "My mother used to be a teacher for the blind when I was young, and I was amazed by the fact that people could function freely without vision. From then on, I was inspired to explore our ‘abilities’. By becoming a physiotherapist, I could help people move better, feel stronger, and live longer. " This is the aim of Projects Abroad’s Philippines Physiotherapy Project: finding the right therapy approach for children with disabilities so they can become mobile in their everyday lives, and eventually integrate into their local community and enhance their overall quality of life. Find out how you can contribute to our Physiotherapy Project in the Philippines or take a look at some of our other Medical & Health Care placements around the world.